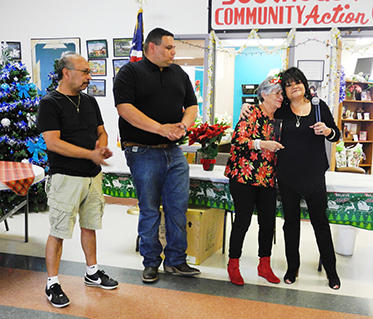 Belinda Lopez, right, Artesia director of the Southeast New Mexico Community Action Corporation (SNMCAC), embraces Eva Chavarria last week at the Artesia MealSite after the SNMCAC named the late Rolando Chavarria as its Volunteer of the Year. His wife, Eva, was presented with a plaque in his honor. “Without our volunteers,” Lopez said, “we couldn’t keep this program going. Rolando helped the Site every single day. He would just show up with whatever we needed, without even being asked, and I believe he is still watching over us and sending us help from above.” Also pictured are Chavarria’s son Rocky, far left, and grandson Chris.